I remember once asking about sliding door on Instagram during the bodieandfourenovations and got a lot of answers and feedback to my query so I’m sure you will love this sliding door. My thought when I came across was…WOW…there is sliding door and there is that kind of sliding door! They basically put together a bunch of wooden shutters & doors to create one striking and beautiful, vintage panel. In essence, it’s not difficult to do but the tricky part, I think, will be to manage the overall weight of the door and to secure a track strong enough to bear the weight. Also, this is the third of my DETAILS series and I would love to know what you think of this little series which is meant to highlight one specific detail and over time, enable you to build a nice collection of interesting and stylish details to apply to future interior design projects. You know how to pick out the good stuff!! What a genial idea.. I agree it’s probably not as simple as it seems considering weight and all but stunning!! 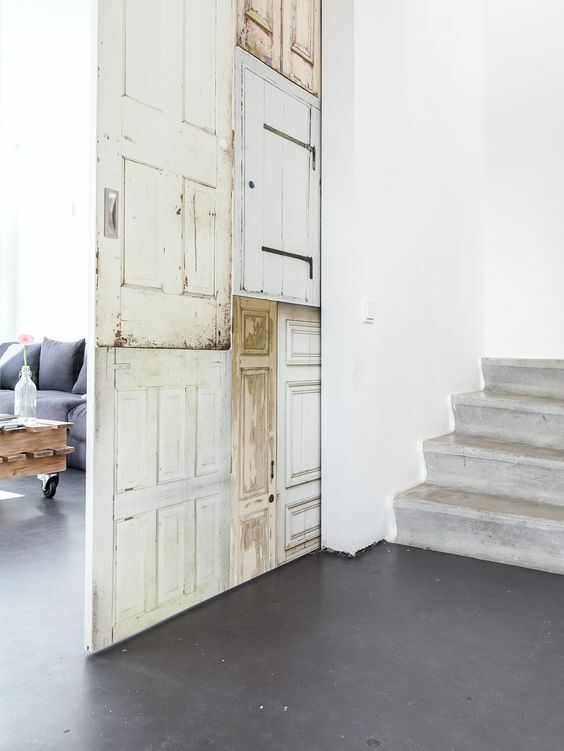 I was even thinking a plan slinding door could be decorated with a nice wallpaper- like the ones sold at Merci for a similar look in case this type too complicated for certain doors? In general I really appreciate your Details- idea???? Yes the ones sold at Merci are the wallpaper from NLXL which I used to sell in my e-shop when I was still running it. I covered a wall in one of our bedrooms in France and it looks like the real thing! Ok sorry for my sloppy spelling.. Should have put on glasses! It should of course be: plain sliding door!! Lovely post and like the idea of detailing a specific area, too much info can sometimes be overwhelming – so a series of snapshot detail is great! I have also sent an IG message of a beautiful account, which you may have come across, but may be a good source for advice on the hanging rails! Thanks for your feedback Karen and thanks for telling me about IG, I hardly never checked my messages there but indeed it is a really beautiful sliding door! Actually this is walpaper. It is from a Dutch brand ONSZELF. http://onszelf.com/ So there is no weight problem. Yes same for me but hopefully I will be able to use it one day!